Some still think of H. L. (Hod) Roberson as an exemplary Texas Ranger who met his death while quietly sitting in a chair in 1923. Even today, the Officer Down Memorial Page remembers Roberson as a law enforcement hero with no mention of his dubious past. But there is more to his story. "Hod" Roberson lived by the gun and died by the gun. He should be more accurately described as a cold-blooded killer whose gun was for hire. Between 1911 and 1923 H. L. Roberson killed more than a few men in Texas and in Mexico. One probably inflated story claims he killed 38 men in his lifetime. Robertson first put on a Texas Ranger badge in 1911 at the age of 38 years when he joined Captain John Hughes" Ranger Company A in El Paso. Within months, the new ranger shot and killed a drunk Mexican at Calaro a village east of El Paso. Following the incident, Roberson spent some time exiled to the Texas Panhandle. Captain Hughes liked Robertson, however and appointed him to sergeant of A Company in 1913. In 1914, Roberson and Ranger Ira Cline tried to serve a search warrant on Carlos Morales Wood, editor of a Spanish language newspaper in Valentine. Although the Rangers shot Wood dead in very suspicious circumstances they were acquitted in a murder trial the claiming the editor had pulled a pistol on them. Roberson resigned from the Rangers in 1914 and became the foreman of the infamous T.O. Ranch of Chihuahua. As foreman he led some dozen or so gun men that ran roughshod over the huge border ranch. The T.O. men controlled controlled a fair amount of the border north of Candelaria to El Paso on the Mexican side terrorizing anyone who got in their way. Pancho Villa and his agents did considerable business with the T.O. Ranch bringing many herds of stolen cattle and horses to the ranch to be brokered into Texas. About 1914, some said General Villa personally ran Hod Roberson and his men out of Mexico outside Ojinaga. Another account states that the Roberson gang were arrested and deported by Mexican soldiers for branding stolen Terrazas cattle. A short time later, Roberson and some twenty of his men shot and killed Febronio Calanche and Rodrogo Barragan as they slept on the Texas riverbank at the Los Fresnos Crossing north of Candelaria. Justice of the Peace J.J. Kilpatrick wrote of the incident, "I have always felt sure it was either Roberson who shot to death Barragan and Calanche or ordered it done". Nothing came of the killings but in 1915, Roberson found himself on trial for more murders in El Paso. Details of the fatal shooting of Henry Foote Boykin and Walter Sitters are in my previous blog article. Here I offer some information about the Roberson murder trial. Many Hudsbeth County ranchers did not like Hod Roberson. It is likely they did not appreciate the fact that he and the T.O. Ranch illegally brought thousands of cattle stolen in Mexico to Sierra Blanca to sell at very cheap prices. The T.O. Ranch engaged in very lucrative arms for cattle trade during the Mexican Revolution. At one point after U.S. President Woodrow Wilson imposed an arms embargo on Pancho Villa, stolen Mexican cattle brought only $5 a head in exchange for rifle and pistol cartridges priced at $1 per round. Honest Texas ranchers simply could not compete with these prices. Following the Boykin and Sitters murders, Roberson was charged with murder and surrendered to some of his Texas Ranger friends in El Paso. He posted a $7,500 bond and entered a plea of self-defense. The sensational trial made front-page news in the El Paso newspapers as some of the finest legal minds in Texas met head to head in the district court room. On December 4, 1915, the jury found Roberson guilty of murder and he received a 20-year prison sentence. His attorneys quickly moved for a mistrial after one of the jurors admitted being a convicted felon. Two weeks later, Judge Dan M. Jackson set aside this verdict and granted a new trial. In November 1916 another jury found Roberson guilty of manslaughter and gave him another five-year sentence. Again his lawyers moved for a new trial. When the judge denied the motion, Roberson's attorneys appealed the case to the Texas Court of Criminal Appeals in Austin that upheld the verdict. Six months later, the court reversed itself for unclear reasons and sent the case back to Hudspeth County for trial. In a change of venue, the case went back to the El Paso District Court in November 1919 where another jury convicted Roberson of manslaughter with a two year sentence. Roberson's lawyers moved for another trial and a change of venue. Finally in June 1920 a Travis County court let the gunman off the hook with an acquittal. The curious part of all this is the fact that even during the midst of his considerable legal troubles, Hod Roberson retained various commissions as a Texas and Federal lawman. From 1916 until he was killed in 1923 he worked as a law officer as an inspector for the Texas Cattle Raisers Association while also holding an appointment as a Special Texas Ranger, Midland County Deputy and Deputy U.S. Marshall. Many Texas lawmen, including Texas Ranger Captain John Hughes, helped Robinson with money for his defense and posting his bonds. Looking back, this certainly does not speak well about the integrity of Texas lawmen of those days. In April 1923, Hod Roberson and fellow brand inspector Dave Allison were sitting on the porch of the Gaines Hotel in Seminole, Texas. They were in town to testify at the trial of two rustlers. The evening before the trial, the rustlers attacked Roberson and Allison on the porch and killed both of them in a wild series of pistol shots and shotgun blasts. When she heard the shots, Robinson's wife ran downstairs from her room in the hotel and shot both of her husband's attackers with his small automatic back up pistol. Although wounded both rustlers escaped after bringing an end to the career of a gunman with a Texas Ranger badge. While researching the burial location of my great-grandfather, Henry Foote Boykin, I came across your website listing his obituary in 1915. Since my grandfather, Henry Foote Boykin, Jr., was only three years old when his father was killed, he never could tell me a lot about his father. I wondered if you had any more information about H.F. Boykin that you could share with me. I look forward to hearing from you soon. Tammy, you are in luck as I have found a fair amount of information about the murder of your great grandfather, H. F. Boykin. H. F. Boykin was born May 3, 1875 and met a tragic death at the age of 40 years on January 16, 1915 in Sierra Blanca Texas. He and Walter Sitters, son of Texas Ranger Joe Sitters, were gunned down by Horace Lorenzo (Hod) Roberson, a Texas Ranger with a considerable reputation for the killing of many men. For more about Robertson be sure to search the blog archive for several articles including, "A Cold Blooded Killer With A Texas Ranger Badge". I am working a chapter in my new book, "More Little Known History Of The Texas Big Bend" about Roberson. Below you will find some 1915 newspaper articles about the murders of Boykin and Sitters. Also, there is more information about Roberson's murder trial in the El Paso Times/Herald. You can find copies of the newspaper microfilm files of the El Paso Public Library. Also, UTPB in Odessa has the Times on microfilm. Be sure to check out the excellent EPT index and vertical files at the El Paso library. Good luck with your research. If you have any family photos of your great grandfather, I would greatly appreciate a good copy to use in my new book. Sierra Blanca, Texas, Jan. 16-17, 1915--H.F. Boykin, a prominent citizen of this place, was shot to death in the Texas & Pacific stock pens early this morning by H.L. Roberson, one of the foremen of the T.O. Ranch, in Mexico. Roberson, also shot and seriously wounded Walter Sitters, of Valentine. It seems that Roberson had some cattle in the pens, which were placed in Mr. Boykin's pasture, north of this place, and Mr. Boykin insisted upon counting them before before taking them out. A quarrel insued, with the above results. It is said that Boykin and Sitters were unarmed. Mr. Boykin leaves a wife and five small children, a brother and a host of friends here, and three sisters in El Paso. The names of Boykin's sisters are Miss Florence Boykin, at the Central telephone office, Mrs. T.C. Armstrong, and Mrs. B. Taylor. The hearing of H. L. Roberson on the charge of killing "Foot" Boykin and Walter Sitters at Sierra Blanca, this county, last Saturday, is in progress in the court of Justice of the Peace J. J. Murphy. Testimony was taken Monday afternoon and Tuesday morning and the hearing was then adjourned to the afternoon to await the arrival of more witnesses. When the hearing was resumed at 10 o'clock Tuesday morning, the testimony of James Burns and William Bartzer, the two young men who were "beating their way" to San Antonio and saw the tragedy, was heard. Burns stated that the men were quarreling when he and his friend got off the train. They went over to the stock pens, he stated, to see if they could get a job. When they came up, they saw Boykin on the fence, pointing his finger at Roberson. Roberson struck his hand with a rope, and when Boykin grabbed the rope, Roberson struck the hand with his pistol, he said, and then Boykin threw the rope into the lot. Roberson then rode around to the gate. In the meantime Boykin threw the rope over the fence. Roberson asked him to give him the rope, and Boykin refused, but another man climbed over and handed it to him. Burns testified that he heard Boykin say: "Nobody but a ___ ___ ___ ___ or a coward would pull a gun". He further testified that when Roberson came around the gate, Boykin came at Roberson and he started for him a second time before Roberson fired the first shot. He, Boykin, had something in his left hand-he did not know if it was a knife. Five shots were fired by Roberson, the last one as Boykin was falling. To the state's counsel he stated that he could not remember what Robertson had called Boykin. Words were passed between them but in the excitement he did not catch all that was said. State's counsel reminded him that his memory had been pretty clear concerning the testimony he had given the counsel for the defendant. Burns stated that he told the same story to the justice of the peace at Sierra Blanca and that at 2 p.m. on the same day had been told that he and his partner could go their way. The testimony of William Bartzer was similar to that told by Burns. He declared he did not know whether Boykin had a knife. The state was represented in the case, by Frank Fulle, assistant county attorney, and by R. E. Thomason, special counsel. The defendant was represented by Victor C. Moore. Thomas Cross, of Sierra Blanca, a witness to the tragedy, was the first witness. He stated that he and "Foot" Boykin and others went to the stock pens about 6 a.m. Saturday, January 16, to load some steers. While thus engaged some of the animals got mixed up with others in the pen and they were engaged in counting the animals when H. L. Roberson drove up. When Roberson, rode up he called out, "What in the hell are you doing here? He told Boykin to get out, he testified, "Boykin told him he wouldn't and then Roberson and then Roberson said, "You ___ ___ ___ ___ you will get out." Boykin called him the same name and told him he wouldn't get out." Boykin climbed up on the fence and Roberson then struck him with a rope. Then he pulled out his pistol and struck Boykin on the hand." The he asked for his rope and I handed it to him. Roberson rode around and into the corral and shot Boykin four times. Then he rode away." Cross admitted to counsel for the defense that Boykin had a knife in his hand before Roberson hit him with the rope. He also admitted that he did not feel friendly towards the defendant. Elmer Norton, aged 14 years, another witness to the shooting, stated that when he came up, Roberson was telling Boykin to take back what he called him and Boykin refused. He stated that he saw Roberson hit Boykin with a rope and saw the latter pull the rope from his hand. He stated that he saw Roberson hit Boykin on the hand with his pistol, and then he saw Boykin step back into the corral. Roberson, he stated, rode around and came through the gate into the corral. Boykin moved towards him. Roberson's animal wheeled around and Roberson fired over his shoulder, he declared, the shot hitting Walter Sitters. Then he fired four more shots at Boykin, he stated, the last one being fired after Boykin hit the ground. He admitted to counsel for the defense that there was considerable bad feeling in Sierra Blanca against Roberson. He also admitted that some indirect efforts had been made to influence his testimony. He stated that his father told him to tell the truth. To the attorney for the state he stated that Boykin had told Roberson he was unarmed. When Roberson fired the second shot Boykin kept moving from side to side as though attempting to dodge further shots, he declared. William Norton, aged 17, a brother of Elmer Norton, corroborated his brother's testimony in its essential details. He was questioned concerning the feeling in Sierra Blanca against, "the T.O. people." Asked by the defendant's counsel if he had not been urged not to tell some things about the tragedy, he stated that two or three men had asked when the case was coming up. Later, he admitted that he had told them he was going to tell the truth. "I, Norton, father of the two Norton boys, was the last witness examined during the afternoon. He was examined by the counsel for the defendant as to the feeling in Sierra Blanca and the "T.O. People". He stated that there was considerable feeling against them. "Is it not a fact, Mr. Norton, that when I attempted to ask you earlier in the day about the affair in Sierra Blanca, you said you did not have time to talk to me?" asked attorney Victor Moore. "Yes, I was summoned to the grand jury and testified." Norton's testimony concerning the tragedy, which he witnessed, was similar to that of the witnesses who had d him. Concerning the knife, which Boykin is alleged to have held in his hand, the witness stated that it was a pocket knife with a blade perhaps two and five-eighths inches in length. He stated he had assisted in removing the clothes from the body of he dead man and said that the man was shot once in the back, once in the left side, once in the arm and once in the chest just below the neck. Judge J.J. Murphy announced Tuesday afternoon, following the conclusion of the preliminary hearing, the he would hold Roberson on a bond of $5,000 on the charge of having shot Boykin and $2,500 on the charge of having shot Sitters. It is probable that Roberson will give the combined bonds of $7,500 pending the grand jury hearing and will be released. Pancho Villa, well supplied after taking Juarez in mid-November 1913, sent three brigades of about 3,000 men to attack Ojinaga and entrap a long time foe, Gen. Luis Terrazas, who was trying to escape to the United States with gold bullion believed to be valued at $2 million. The tree brigades, moving from separate areas of Chihuahua, traveled on horseback and on foot. Villa assigned 500 of his own brigade to the battle. The Gonzales Ortega Brigade, commanded by Torbino Ortega, had more than 550 soldiers. Fresh from the brief skirmish at Chihuahua City, the brigade also had two batteries of 75-millimeter cannon and some heavy machine guns. A member of the Ortega brigade, Pedro Cabrajal, lives in Ojinaga. The 71-year-old veteran of Villa's army was a foot soldier. Until recently, he served as night watchman at the Ojinaga mayor's home. Cabrajal and a childhood friend, Ignacio Rodriquez, 72, fought nearly a month at Ojinaga during that cold January in 1914. Although the two men grew up together in the Ojinaga area, they battled each other. Rodriguez was sergeant with the federal forces. Recently, the two veterans recalled the battle during an all-day interview which started in the Ojinaga mayor's office and ended when a hard thunderstorm fell over the battleground as the two men pointed out positions from which each fought. Cabrajal said the brigade he was in left Chihuahua City a few days before Christmas. According to records, it was on Dec. 22, 1913. First contact between the Villa forces and the federal troops in Ojinaga came on New Year's Day, 1914. Rodriquez said a cavalry patrol saw the first Villa troops moving on the city from the south. The patrol attacked the Villa soldiers and blew up an artillery piece. In the ensuing fight, the federal soldiers caused many causalities and caused the first contingent of Villa soldiers to retreat. Cabrajal was not in the first fight with the federals, nor was Rodriguez involved. Rodriquez was in the federal troop encampment in the center of town. On New Year's night, Cabrajal and other Villa infantry moved closer to the town. "It was very cold," Cabrajal recalled, "Many had blankets and some of the soldiers had no shoes. Many hundreds of fires could be seen over the countryside as the men tried to warm themselves." On the third day, federal troops, mostly on horseback charged the Villa lines. Rodriquez was one of them. Federal artillery supported the attack. "We rode right into the first of them, hollering and shooting," Rodriquez said. "Many ran and were shot. Some were trampled under the horses." Cabrajal said he lay in his shallow rifle pit and just fired his rifle at the first horseman he could see. Asked if he saw any federal troops fall, he could only shrug his shoulders. The fight ended in less than an hour. Villa artillery slammed into the federals and forced them to retreat to the town. Only minor casualties were inflicted on the cavalry troops, but Villa lost more than 100 men. An additional 130 were taken prisoner. According to Mexican official records, Villa lost more than 300 men the first three days of the Ojinaga attack. About 200 were killed in the first skirmish. Another 100 died died in the federal attack on Jan. 3. The prisoners were herded into Ojinaga and held overnight. They were shot the next day. Although Rodriquez knew of the Villa men being shot, he said he did not take part in the executions. Cabrajal said the Villa forces retreated a second time from the battle to the base of a mountain just south of Ojinaga. During the withdrawal, federal forces ambushed a Villa column in a draw not far from the present site of the new Ojinaga railroad station. "Hundreds were slaughtered there like cattle," Cabrajal said. The draw, now called Arroyo del Muerte is filled in some. Many Ojinaga residents say more than 1,000 bodies were counted there after the battle was over. Most of the bodies were buried there, they say. Rodriquez said federal troops were ordered to dig entrenchments about the town during a lull in the fight. "We were heavily outnumbered, but we were ordered to make a stand," he said. Rodriquez said many of the soldiers in the town sympathized with the Villa movement, including himself, but they had to fight or be shot. "Life wasn't worth much," he said. The two men said they knew of many instances in which brother fought against brother and father fought against sons during the revolution. Cabrajal, a teenager during the battle, joined Villa in 1911. The old Villa soldier said he was recruited along with a number of relatives to fight by his brigade leader, Ortega. "It was for a cause," he said. "My family was poor. We had no land. Ortega said when the fighting was over, everyone would be given land to farm." Rodriquez, the federal trooper, joined the army because he couldn't find work. He said he liked the army because he was given clothes, food, a good place to sleep and he had a fine horse. He said he was given a peso a day (21 cents). Commander of Rodriquez's troop was Capt. Marcus Cano. Cano, also an Ojinaga resident, died several years ago. The federal troops stationed at Ojinaga numbered about 350 regulars and about 60 reserves. Federal soldiers with Terrazas boosted the total to about 600. Villa advised of discontent among brigade leaders, sent an additional 2,000 men into the Ojinaga battle on Jan. 6. he directed Martiniano Servin, an artillery commander to take command of the Villa forces until he could arrive on the scene. On Jan. 10, it was announced that Villa was with his troops. A stream of refugees, ignoring sniper fire, fled Ojinaga to Presidio. Now more than 2,000 refugees were interred there. On Jan. 11, Villa mounted the final attack on Ojinaga. He sent a column of 800 men to attack the town from the south, led by his generals Hernandez and Jose Rodriquez. Just west of the town, Villa placed his artillery in an area between the Conchos and Rio Bravo (Rio Grande). Villa with 900 men under his direct command, and Toribio Ortega's brigade reinforced to 700 men, started advancing from the north just at daybreak. Salvador Mercado and Pascual Orozco, federal forces leaders, directed the defense of the city from the old customs house. Pedro Cabrajal, the Villa foot soldier who still lives in Ojinaga, said the rifle fire was intense from the town as the Ortega men advanced across the chaparral area, immediately across from where the international bridge is now located. We ran and hollered "Viva Villa", Cabrajal sid with a gleam in his eyes. Ignacio Rodriquez, a federal soldier during the night now a retired railroad worker living in Ojinaga, said the Villa forces moved out of the draws and arroyos surrounding the town and started swarming toward them. "Hundreds and hundreds came yelling and shooting," he said. "We were frightened but our officers would not let us leave the trenches. They told us to shoot." Villa's artillery pounded the city and the trench fortifications. Some of the shells screamed over the Rio Grande and exploded within several hundred yards of Presidio. Carlos Spencer, a storekeeper in Presidio, said he remembers his father telling of the shells falling near the first Spencer store. Small arms punctured the store's kerosene storage tank. "Presidio was much closer to the river then," Spencer explained. "The town site was moved back from the river after a bad flood in the "20's." Americans sent a note to Villa's artillery commander asking that the gun's elevation be lowered. It was done so immediately. But when the artillery was adjusted, some of the shells then fell among Villa's own men, Cabrajal recalled. "Several men near me were blown to bits when a shell landed close by," he said. The final battle, fought during the late morning hours and early afternoon, lasted only a few hours. The federals, outnumbered 5 to 1, retreated to the river and crossed over, only to be rounded up by U.S. cavalrymen from Marfa, sent to protect Presidio. Villa lost an estimated 100 soldiers in the final assault. Some historians have put the Villa dead at a much higher figure. But Cabrajal said losses were light on the final day. "The Federalists lost heavily in the last attack," Cabrajal said. Rodriquez, one of the federal soldiers to escape to Presidio, was put into a camp with other soldiers. Their arms, munitions and other supplies were taken over by the U.S. Army. Cabrajal said the chaparral area was littered with destroyed, dead horses, bodies of dead and wounded. "The wounded were cared for by several doctors in the Villa army," he said. "Many of the wounded, both Villa and army men were carried to Presidio for treatment." Cabrajal said after the town was taken, the Villa troops sacked homes for food, clothing and gold. We just stayed around the town for about a week before leaving, he said. During the week after the battle, townspeople were told to bury the dead. Some of the federal troops, watched carefully by Americans ordered to protect them from the Villistas, also helped bury the dead. Cabrajal said most of the Villa men just rested, drank and ate while the townsmen cared for the dead and wounded. Equipment left behind was quickly collected for Villa's rag-tag army. Rodriquez walked to Marfa with the thousands of refugees, where all were put aboard trains and sent to Fort Bliss. He stayed in the United States and worked on the Southern Pacific Railroad after the revolution until 1926. he returned to Ojinaga and worked as a laborer. Cabrajal fought two more years with Villa. He was seriously wounded in a battle on the Durango-Chihuahua border in early 1916. He finally returned to the Ojinaga area about 1920. He lives with his sons. Rodriquez lives with his daughters. The men said there were several Ojinaga residents who fought in the battle, but most are now gone. Occasionally, Cabrajal and Rodriquez talk over the fight with these few surviving friends. Both said they wouldn't fight again if they had their lives to live over. "We did not get anything out of the battle, except to nearly get killed," Cabrajal said. Rodriquez said the fight came about over politics. "There was no other way except to do battle," explaining why the political fight ended in bloodshed. "There were no speeches" just fighting, he continued. Cabrajal said he has no interest in politics. "We don't dedicate ourselves to parties anymore," he explained. In mid-October 1965, a new mayor took office in Ojinaga, just across the river from Presidio. A gala fiesta was planned for the change in municipal officials. Dignitaries from all over the state of Chihuahua were on hand for the event. But probably the most important person there was Luz Corral Villa, a spry 72-year-old matron with shining eyes, steel gray hair and a broad smile. Luz Villa is the widow of Pancho Villa, on of the most famous men in Mexico. Although more than 50 years ago Villa's army of peasant soldiers sacked Ojinaga after a bloody battle in which mort than 1,000 persons died violently, Senora Villa was given one the biggest welcomes any VIP could receive from Ojinaga citizens. What was the secret of Senora Villa's acceptance, not only in Ojinaga but in cities though out the United States, including Columbus, N.M., where Americans died before Villas guns? "The older people remember what Pancho Villa did for the poor." Senora Villa said, "Even though there was much bloodshed many years ago, the poor classes still remember him as their hero, their Robin Hood." She readily admits that Villa had many mistresses and sired some 15 children by different women by several women, her eyes sparkle as she speaks of the bandit-general's exploits and their brief and hectic married life. Senora Villa maintains a Pancho Villa museum in Chihuahua City. She lives in the same house Villa bought in 1906 from the money taken in bandit raids. The 50-room house has been rebuilt twice since it was purchased. It was destroyed during the Mexican Revolution in 1913 and during the war between Villa and Carranza in 1917. "Pancho didn't especially like politics," Senior Villa said during an interview in Ojinaga. "He had a strong sense of loyalty to the poor. He was pushed or forced to take part in the revolution," she said. 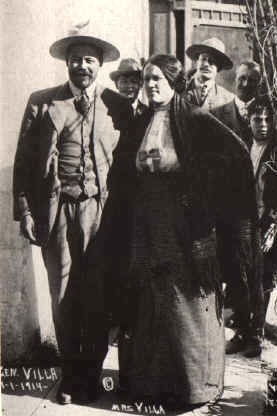 During the height of Villa's successes when he was undisputed dictator of all the northern provinces of Mexico, Senora Villa lived in seclusion in El Paso. "I saw my husband for several days each month during the revolution when he would sneak into El Paso," she said. When he and Carranza fought, Pancho sent me to Havana, Cuba for safety." Senor Villa was in Havana during the last revolutionary struggle. Her home in Chihuahua City was destroyed a second time. When the Columbus, N.M. raid was staged in 1916, Villa had just sent his wife to Havana. "I knew he was planning to attack an American town, but I did not know where or when," she said recently. "Pancho was furious with President Wilson for stopping the shipment of arms to him. He felt that the American president was in agreement with his actions. The raid was a retaliation for President Wilson's arms emabargo." Senora Villa said stories saying Pancho Villa was not at Columbus during the raid are not true. He planned and led the raid, she said, even though he was advised by his generals not to do so. They told him the American soldiers would follow and destroy him but he would not listen. Senora Villa said her husband was very hot-tempered but was not cruel. "He despised cowards and incompetent offices." Villa hanged hundreds of persons in Durango and Chihuahua accused of desertion from his peasant army. Historians note, too, he had numerous officers in his band shot for failing to carry out his orders. "The poor people are the ones who truly love him and his memory," she said. "Others hate and despise his name." Senora Villa said her husband never drank to excess. "He enjoyed parties" and found many beautiful women at the gatherings. He was famous. Women threw themselves at him," she added, explaining his many love affairs and many children." The bandit's wife reared five of the reported 15 children born to various Villa mistresses. Three of his daughters and two sons are still living. A son, Samuel Villa, still resides in Chihuahua City. Octavio Villa, a minor government official, was killed at an ambush at Matamoros about two years ago. Another son, Agustin Villa, is in a mental hospital in Los Angeles. A nephew of Villa's, his namesake, fought in World War II with the U.S. Army. He was a paratrooper, Senora Villa said. The nephew now lives in Los Angeles. 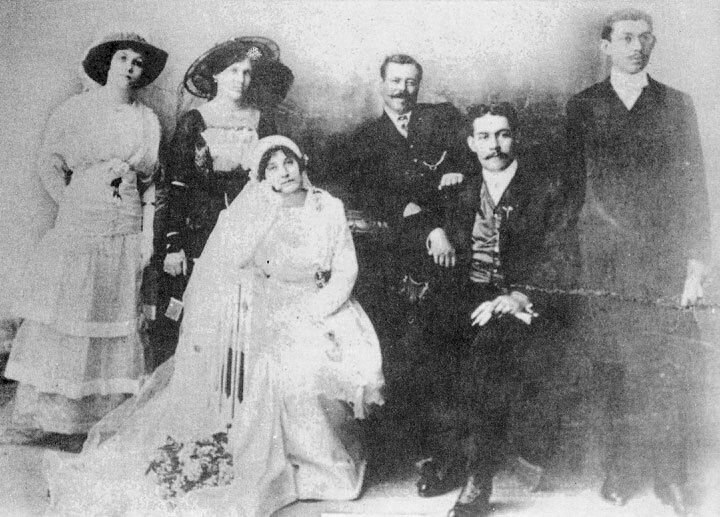 Villa and Luz were married in 1911 when she was l8 years old. They met in 1910 when he took over her hometown of San Andres. He was a bandit chieftain, she said. Senora Villa was living in Chihuahua City when Villa was gunned down in an ambush near Parral, Chihuahua, a mining center. His ranch, called Canutillo Hacienda, was near Parral but in the state of Durango. "The ranch was taken by the government", she said, "because Villa was accused of owing the government more than $80,000 in taxes." The revolutionary's widow said tales of Villa treasure being buried in the Sierra Madre Mountains is false. "If there had been a lot of treasure he would not have had to ask for so many loans." "The money taken from banks during the revolution went for and ammunition, uniforms and other equipment," Senora Villa said, "He was always in need of money for ammunition. During the last days of fighting, he had to ay two and three times for it (munitions) than its actual price since most of it had to be smuggled into Mexico." In 1922, a year before he was killed, Villa was approached by an American film company about appearing in a motion picture about his life. "Pancho refused to take part in the picture unless the company could promote the construction of a school in corporation with the Mexican government," Senora Villa said. The school, to be used by orphans, was rejected by the Mexican government. No reason was given for the refusal, even though the school was badly needed. The famous bandit loved children, his wife said. "Pancho used to pick up children off the streets and take them to school. He took 300 children and fed them and bought them clothes at one time in Juarez." Pancho and Luz Villa had a baby girl about a year after their marriage, but the infant died. "I would have been proud to have had her live," Senora Villa said. In 1950, Mexican president Aleman made an offer to rebuild the Villa home in its original state but nothing ever came of the offer. Senora Villa, however, has restored the home out of her funds, raised though donations to her Villa museum. She lives alone in Chihuahua City, except for several servants who also help maintain the museum. Last August and September, more than 3,000 persons visited her home to see the large collection of Villa papers, uniforms and other personal items of the late revolutionary. On display is the Dodge touring car in which Villa was riding when shot to death, battle flags, weapons of all kinds, uniforms, his desk, letters and other numerous items. Senora Villa said she had ten volumes of registration books containing more than of visitors to the museum. "Guests have come from all over the world," she said. Senora Villa is also a traveler. She has been all over the United States and has made several jet flights. Early in 1965, she toured the U.S. appearing in person at premier showings of a documentary film on Villa made during the revolution. The film, put together from silent newsreels, but narrated, was produced by Columbia Pictures, Inc. The film company paid Senora Villa's expenses on the journey. She said she tries to make several trips a year to Juarez. Her recent trip to Ojinaga was the first such trip in years. She was a houseguest of Mr. and Mrs. Pete Valenzula who she met in Chihuahua City about 12 years ago. Valenzula is a clerk in the Spencer Store at Presidio and has lived in the immediate area since birth. Senora Villa's best friend and traveling companion is Senora Margaret H. Campos, a Chihuahua City music teacher. They have been friends for more than 40 years. Villa's wife's greatest wish is that Pancho could have lived out his life more peacefully. She said he was a happy man, although he was virtually in exile on his Durango ranch. He was a big man, standing about six feet tall and weighing more than 200 pounds. He was graceful in his movements, and had a commanding voice. His very being expressed confidence. "He had a strong sense of loyalty to the poor," she said. "He knew the hardship of being a field-hand, a laborer. He only wanted the poor to have more to eat, better living conditions and better education. These things he and his family had done without." In April, a highlight of Senora Villa's life came when Governor Campbell of New Mexico visited her in Chihuahua City to discuss plans for the extension of U.S. Highway 180 from Columbus, N.M. into Mexico and into the state of Durango. The scenic highway Federal Road 45 in Mexico, would be called the Pancho Villa Trail. The highway should be an international effort. Mexican peasants still call Pancho Villa, "mucho hombre." He will always be "a big man" to Luz Villa, his wife. 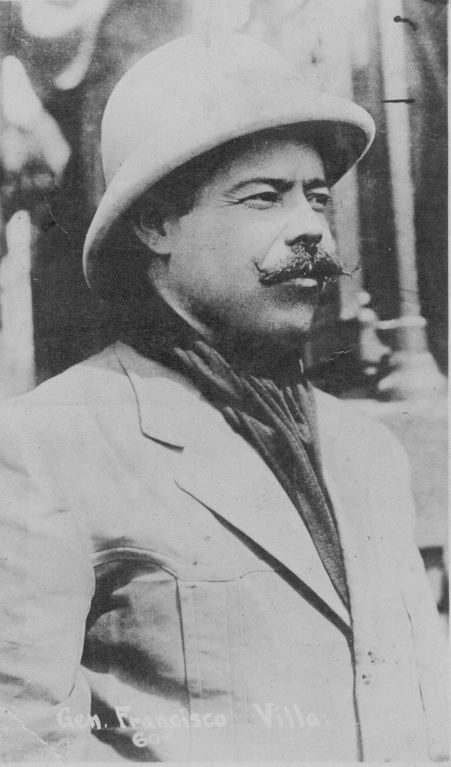 Pancho Villa died on a hot July afternoon in 1923 as he and four bodyguards traveled a dusty road outside Parral. More than a dozen heavily armed men blasted the Villa car as it started over a bridge crossing a shallow ravine. The gunmen, believed hired by Mexico City politicians, had hidden in ambush in a deserted adobe house. Senora Villa said she did not know who killed her famous husband. She suspects he was assassinated by political foes. "He was being mentioned too much in the news," she said. "He didn't like the way the government under Obregon was being run and said so on a number of occasions. He was killed because the politicians suspected he was being urged to lead another revolt." Luz Villa's husband died as he had lived violently and with a pistol in his hand. "He trusted the government when he was granted the pardon. But they (the politicians) apparently didn't trust him," she said.